I’m not really in the market for a boyfriend. I’ve got my hands full thank-you-very-much. This is about “Boyfriend”, another in the sea of celebu-scents. This one is by Kate Walsh, the actress from “Grey’s Anatomy” and “Private Practice”. I don’t watch either show, but I was intrigued by the premise of this scent, which is, “Inspired by the longing felt for [a] boyfriend’s warm scent.” OK, I get the longing and the warm part, but men and women have been swapping fragrance for as long as anyone can remember. There’s really nothing new about a woman stealing her boyfriend’s scent, along with his shirt, sweats, what have you. The androgyny trend skyrocketed way back in the 90s with CK One and it exploded from there. So what’s so hot about “Boyfriend”? After a bit more research, and clicking over to the Sephora channel on YouTube (who doesn’t have a channel on YouTube? ), I learned that Walsh didn’t create “Boyfriend” to be a shared, or unisex scent. It is meant to incorporate the smells of a man with feminine notes of a female scent. She reminisces in one of the YouTube clips about how she loved the smell of her grandfather’s after shave when she was a little girl, and how after a breakup, she found herself at a men’s fragrance counter looking for a scent that would replicate the way her ex-boyfriend smelled. And then she had her fragrance epiphany: wouldn’t it be great if she could create a scent that was feminine, yet warm like the scent of a boyfriend? Isn’t that something we all grapple with? “Boyfriend’s” notes are dark plum, myrrh, night blooming jasmine, benzoin tears, skin musk, golden amber and vanilla woods. You know how if you keep digging through piles of crap, you’ll eventually strike gold? Well, I wouldn’t exactly classify it as gold, but in the realm of celebu-scents, this one is actually pretty good. It’s got a plummy, stewed fruit Serge-y vibe which immediately got my attention, plus the myrrh and jasmine at the top give it an almost coconutty, tropical feel. The drydown is pretty masculine; the woods are prominent, as is the amber. It straddles the border of a masculine men’s cologne-type of fragrance, but falls short of going over to that side. It’s interesting, and much better than I was expecting. But again, it is far from groundbreaking. It’s no Jeux de Peau, because there isn’t a world full of women hankering to smell like pancakes, apricots and maple syrup. But I’m sure there are enough Kate Walsh fans, not to mention single women hankering for the smell of a man on their skin, to make this one pretty successful. Don’t get me wrong, I love the way men smell. For me, it has to be a particular man, not just random man smell. If I want that, all I have to do is find a random hockey bag after a beer league game. I guarantee that sort of man-smell will never be bottled. The bottle got my attention as well, for being a nice, solid square chunk of glass, but the flimsy plastic cap ruined it for me, as did the male names etched on the glass. At $65 for 50 ml, it’s a bit pricey, and again, I don’t understand why it has to be $72 here in Canada, especially now that the loonie is a couple of cents above par. Regardless, I dig it, although with warm weather coming, I personally wouldn’t get much mileage out of a scent like this until fall. “Boyfriend” is available at Sephora, which is were I sampled it. Hi sweetie, hope you’re doing well on this beautiful Friday. It’s so funny that you’ve written about this as I was in Sephora the other day, saw it, and thought “Hmmm … interesting.” I got the SA to make me a sample of it and I’m planning to do a test run of it later today, so will report back. If nothing else, I give it props for not being yet another fruitchouli or sugary sweet concoction. Happy weekend to all!! This has been on my radar for a while, Ann. 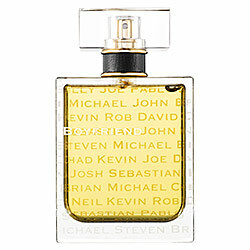 It definitely doesn’t fall into the typical “fruity-floral” or “fruitchouli” category that many of the celeb scents do. Thank God! I’m so glad you reviewed this “Boyfriend” scent,Nava. I’ve been reading a lot of positive comments about it over at MUA, so I was curious to know what notes were in it. Maybe I’ll get to sniff it over the weekend when I’m near the mall & Sephora. Thanks for a good posting — have a great weekend! I agree; the perfume is not bad. Quickly developed into a vanilla woods and stayed there. It was more woody than vanilla on me; the myrrh and jasmine were also very prominent. Nice job, overall. Hey lady, somehow I missed that one. But it sounds funny-cool and worth hearing, if we can figure out what it’s called. I only heard this once – but parts of it stayed with me for WAY TOO LONG!!! It’s really funny and cool and funny and if you were a geeky girl in school, it’s so much fun….:-? No problem! Apparently, it has stuck with me too because all I could remember of it was the last line – 100% Acrylic! And searched for that. The internet is an amazing thing! “Boyfriend” tester here, reporting back for duty: On me, this went on a little boozy, then I got a bit of the coconut to sweeten it (but not quite falling into frozen drink territory), and then, as Shelley mentions above, winds up in vanilla woods (slightly ambery on me). All in all, not too shabby for a celeb-u-scent. And I’m game to try the body cream next (thanks, Shelley). The coconut effect is very fleeting, though isn’t it? Yes, but I find it a nice touch, at least for me, as several of my favorites have a spot of coconut in them, including YSL’s Ysatis and Memoire Liquid Vacances. Subtlety is key; too much is definitely a no-no. Report back what you think about the cream, Ann. I’m actually kinda picky about lotions, and was pleasantly surprised by it. off my list of desires. I tried this the other day in Sephora and was… OK, maybe “wildly impressed” would be too strong, but at least not put off by it! It reminded me of another vaguely spicy, woody vanilla scent that I couldn’t put my finger on — Coco? Shalimar? Hmmm. It was a bit sweet on me, but I’m a sweet-ifier. As for the names on the bottle and box, they struck me as cute, but that joke could get old after a while. And what if your abusive ex-husband’s name was on there? Hey, I refused to try on a pair of jeans the other day because the style had the same name as someone I really, really disliked years ago! i like this one. it reminds very much of uncle serge’s un bois vanille on skin. wish i got more of the plums and jasmine from it – it goes straight into un bois vanille territory almost immediately. Plum? I might have to try this one. But if its super vanilla-ey then I’m out. This is the closest I can come to approximating her pronunciation. Nava, I’ll try this to see what I pull….vanilla or woods. Sing it, sister. I feel that same irritation about a LOT of things right now. At least perfume isn’t as bad as quilting fabric. For the life of me I cannot figure out why I can find beautiful Hoffman batiks across the border for $8 a yard, when I’m paying $18 a meter at home (only 3 inches difference between a meter and a yard). Yeah, yeah, shipping, customs, blah blah blah, I still think it’s ridiculous.